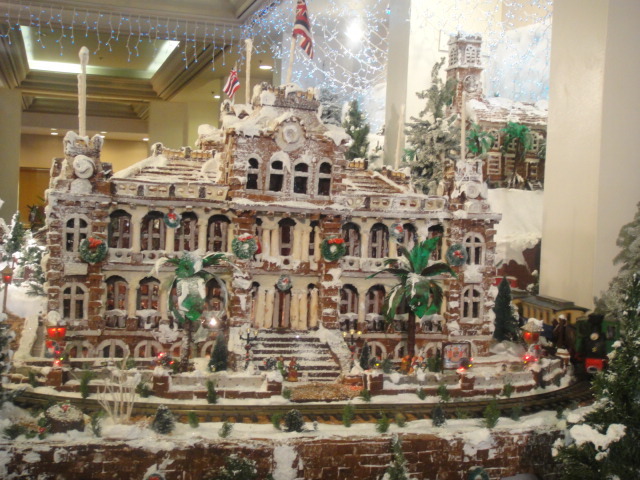 A gingerbread village is not the first thing that comes to mind when I think of Waikiki Beach. There it is, though, an incredibly detailed medieval/German/fantasy village that includes Honolulu’s intricate Iolani Palace. This amazing creation stands in the lobby of the Sheraton Princess Kaiulani, one of Waikiki’s enormous high-rise hotels, and was constructed by Chef Ralf Bauer. He does this every December, each time adding to the scene. There are churches, train stations–yes, a train circles the whole thing–a carousel, quaint houses, and the palace. It took 250 hours to build it from 60 pounds of dark chocolate, 20 pounds of white chocolate, 120 gallons of icing, and who knows how much gingerbread and powdered sugar. The chestnuts are roasting on an open fire only in song, as far as I know, but you can’t get away from the holiday tunes in December, when shoppers are out in full force. But they always are in Waikiki. The displays of shell leis, jewelry, t-shirts, trinkets, and flipflops (“slippahs”) are never-ending, and tourists are happy to buy. Then there’s the famous beach, where hundreds of bodies bake in the winter sun. How can you not love a wide stretch of golden sand, swaying palms, a gentle breeze, and surfers riding the waves? Despite the crowds it’s a mellow scene, and the aloha spirit prevails, most of the time. It’s not my scene for long, though (20 minutes, max); so we hop the #2 bus to Chinatown. (Tip: Take the B Express instead, which makes only a few stops.) Ambling among the shops selling fresh papaya and bananas, pigs’ feet and vegetables I don’t recognize, feels like a visit to China–or San Francisco, Hawaii-style. After a stop in the beautiful Kwan Yin temple and a tour of exotic Foster Botanical Garden, we have lunch at Legend Seafood Restaurant. The dim sum here gets rave reviews for good reason; it’s excellent. Tourists are in the minority in this busy place. Servers wheel carts carrying baskets of hot tidbits: shrimp-stuffed rolls, fried buns with chives, duck slices in sweet sauce, and dozens more. Choose what you want and it’s added to the bill. Prices are reasonable and the experience is fun. 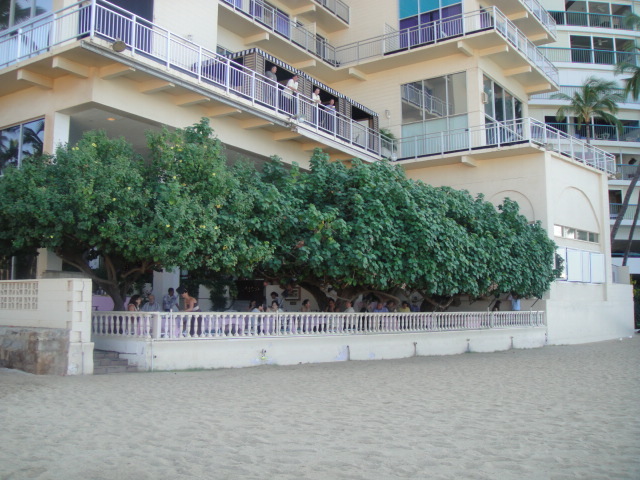 Then it’s back to the tourist world, and maybe a sunset drink at the Hau Tree Bar, our long-time favorite at the far end of the beach, away from the chaos, at the New Otani Kaimana Beach Hotel. A mai-tai and some salty pupus at a table under the huge old tree makes a fine ending to the day.